Dont you just love it when you find out about a new product? Kiehl’s have been one of my favourite brands for skincare simply because they do what they say they will do, there is no flashy gimmicks or over the top packaging there are just products that do what they say on the bottle. 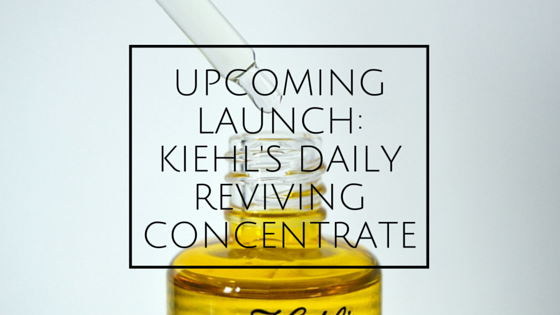 If you didn’t know Kiehl’s is launching a brand new product to go along with the Midnight Recovery Concentrate but to be used during the day instead of the night, say hello to the Daily Reviving Concentrate. Daily Reviving Concentrate has been developed to support skin’s daytime defences. Offering skin it’s own defence system to revitalise and help reduce the signs of skin fatigue. I have been using this for about a week now and i can already feel and see a difference so im rather excited to see what my skin is going to look like after using it for a few months. I find that if you are having a bad day or if you haven’t had enough sleep, Daily Reviving Concentrate is going to be your best friend as it just perks your face up and as it says helps to reduce the signs of skin fatigue. Daily Reviving Concentrate contains a specifically selected, highly concentrated blend of naturally derived ingredients including ginger root essential oils, tamanu and sunflower seed botanical oils. I really like the smell of this product it seems very warming which must be the ginger root. It doesn’t smell overwhelming either once you apply it, it sinks in really easily and the scent dissipates. I love the dropper as i find it makes it so you really waste any product all you need is 3-4 drops applied before your moisturiser. I know you might be thinking its an oil it will make me look greasy but i can tell you now that once this oil sinks into the skin there is no oiliness and there is no residue it wont affect how you apply your makeup either, you’ll find your makeup will actually go on smoother than before. Daily Reviving Concentrate was designed to reduce environmentally-induced oxidation, the non-comedogenic, no mineral oil formula is lightweight, quickly absorbing and helps strengthen and protect the skin barrier for a smooth, healthy look. Kiehl’s Daily Reviving Concentrate (£36*) will be launching in September and available online and from Kiehl’s stores and counters. What do you think of Daily Reviving Concentrate? Whats your favourite Kiehl’s product? You should try it out when it launches i wasnt a big fan of oils but this actually doesnt feel oily if that makes sense? I’ve always been a little shy of trying oils, as you say, in fear of becoming a greasy mess, but this sounds a little bit magical. Having not tried anything from Kiehls yet, this may be my first purchase. I’ve got to admit I love the packaging, if not for actually being useful but because it photographs beautifully! This would be a great first purchase for you! This looks lovely! I’m on such a skincare kick at the moment, this looks like something I’d need to invest in! Look like something I would love to try! Thanks for sharing! if you try it let me know how you get on ive been using it for a while now and loving it! I was lucky enough to win one of these and had toyed with the idea of giving it to my daughter, but after reading your review I think I shall have to selfish & keep it for myself!